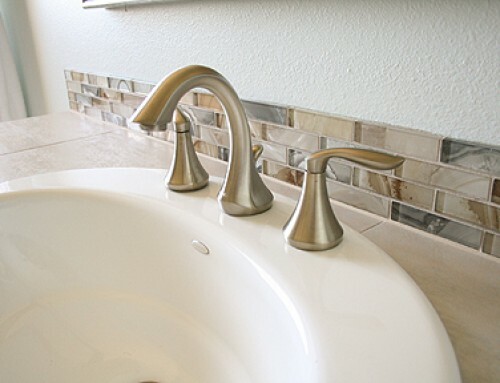 South Austin homeowners Linda and Mark wanted to remodel their 1980s master bathroom, and when they told their contractor that they dreaded the process of picking out tile and bathroom fixtures, Pat Barnett of Ageless Spaces recommended they hire Room Fu to make these selections less overwhelming. 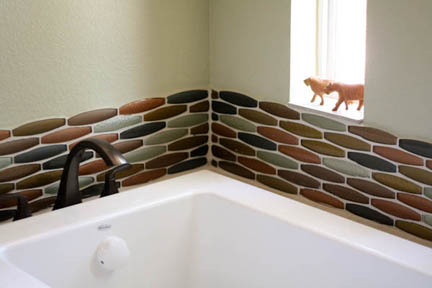 The modern and whimsical shapes of this decorative tile just scream Linda and Mark, and the earthy greens, browns and copper color palette speaks to the sprawling oak trees visible from every window in the couple’s home. 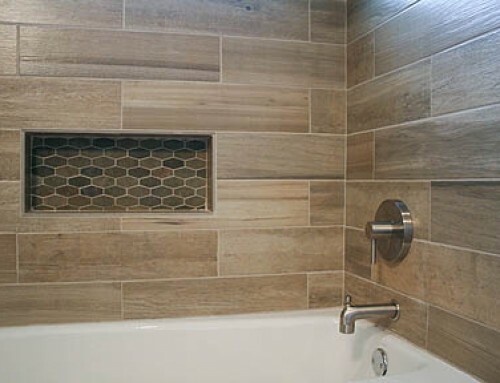 When we presented the sample to Linda and Mark, their delighted gasps echoed our own excitement over it, and confirmed the tile was a slam dunk. 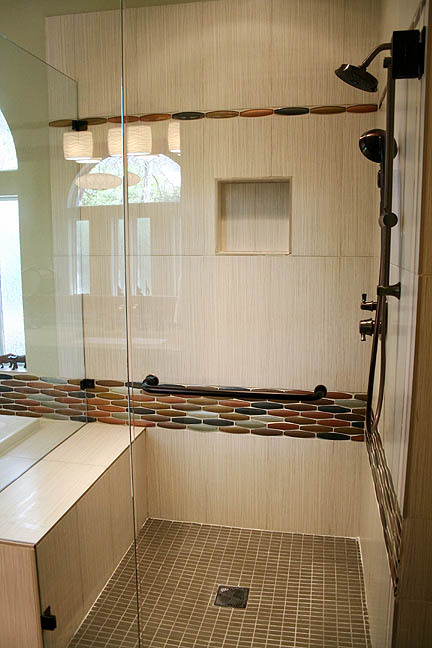 To unify the modern tub and adjacent shower, we ran this glass tile in a continuous band along the tub’s backsplash and throughout the shower surround, then added another horizontal row of glass tile near the shower head, to break up the vertical field tile. 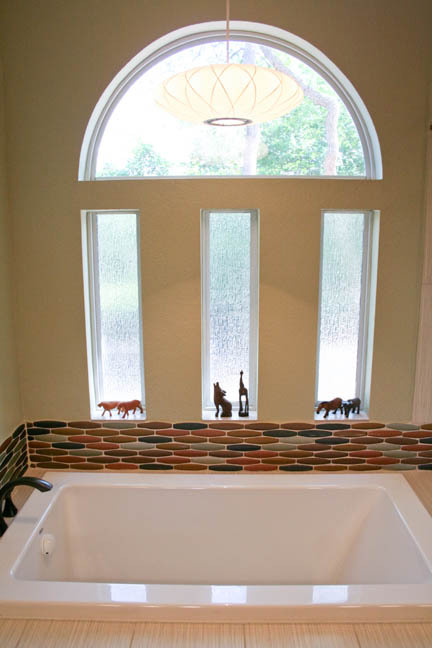 We selected this mid-century modern field tile featuring haphazard and criss-crossed, faintly colored stripes on the tub deck and tub face, throughout the shower, and on the shower bench as well. 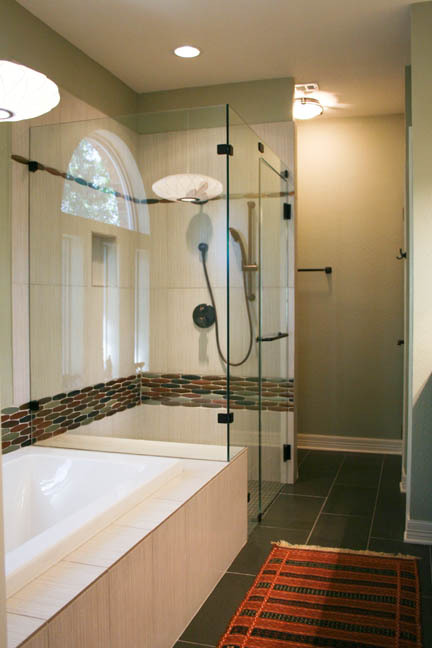 A dark, olive green floor tile grounds the space, and an artfully-designed shower drain—a fabulous find of the homeowners’—adds appeal to an otherwise overlooked detail. 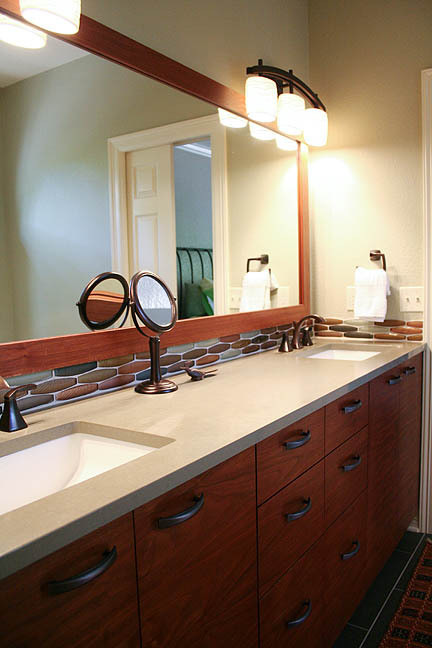 The custom vanity in rich walnut looks positively luscious. 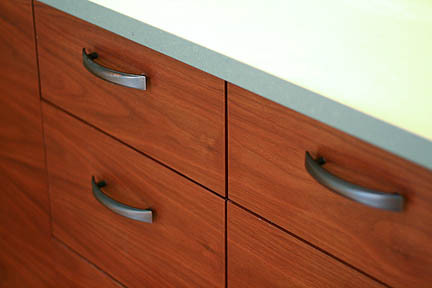 Quartz countertops and modern cabinet hardware in oil-rubbed bronze complete the look. 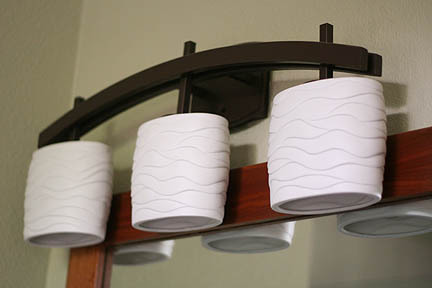 The arched and wave design of the vanity light fixtures echo the contours of the accent tile running throughout the bathroom. 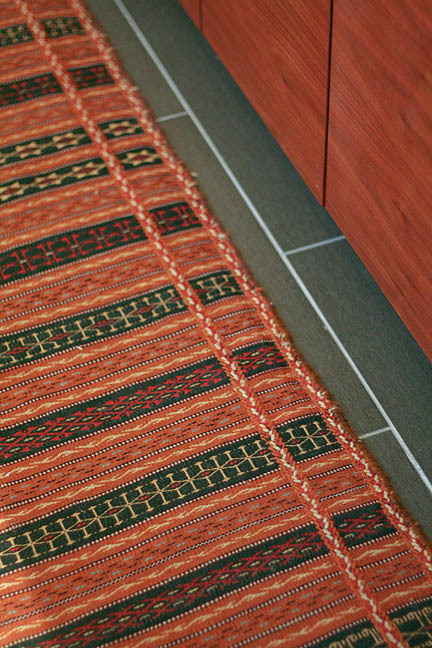 A beautiful Kalati/Qalati kilim runner-type rug from Afghanistan completes the look. 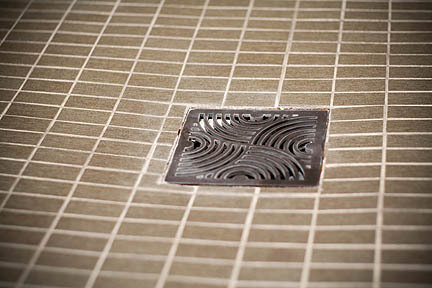 Linda and Mark purchased the rug from Kilimania, a small carpet import business begun by fellow Austinite Carla Petievich to generate revenue for the expansion of girls’ secondary education in Pakistan. You can find more information on the charity organization Carla co-founded to support this cause—the Hoshyar Foundation—by visiting www.hoshyar.org. 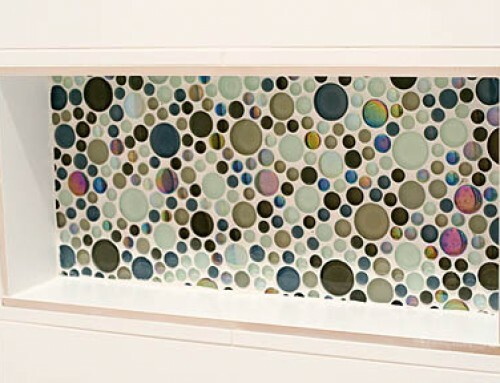 Check out the fun makeover we did for this couple’s living room! 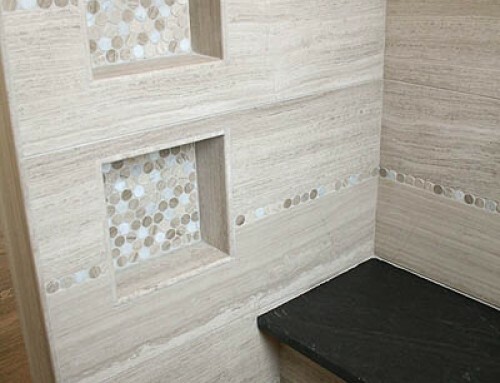 If you are struggling to make selections for your own bathroom remodel, you don’t have to sweat it out alone! 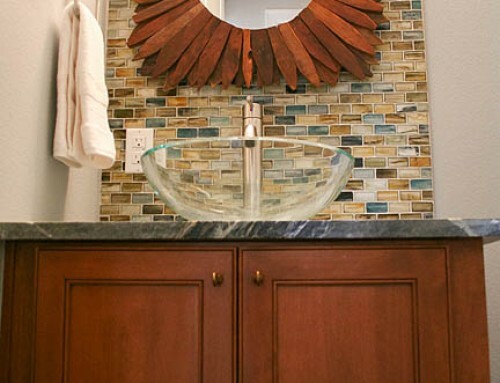 Room Fu interior designers would love to help you create a look that reflects your taste and personality and fits within your budget. Call or text us at (512) 797-5821 to get started!